Have you noticed that the Mets haven’t yet added any veteran big-league arms to the bullpen? There’s a possibility they don’t acquire one significant reliever — though, surely they’ll sign a few pitchers on minor-league deals. What do you think of that? It’s true — there’s a fairly decent chance that the Mets will take their chances with what they have. And it may not be the worst idea in the world, considering where the Mets are in their rebuilding phase, their lack of payroll flexibility (some day, they hope to get out from under the heavy burden of the Curtis Granderson and Bartolo Colon contracts), and their plethora of young arms that need to be auditioned. I suppose Mejia and deGrom may have the opportunity to compete for the fifth-starter spot, but I’m including them here regardless. Personally, I see Mejia as an injury waiting to happen, and believe that if his dangerous mechanics will not be fixed, it would be best to limit his pitches as much as possible — not that that will necessarily prevent an injury, but throwing few pitches from the bullpen might hold off the inevitable a bit. But that’s another can of worms to discuss another day. If I’ve made a mistake on the relievers still available, or missed someone, let me know in the comments. Otherwise, it’s a fairly underwhelming list, isn’t it? I’m thinking the Mets bring back Byrdak, for whatever it’s worth. We can more or less guarantee that Frank-Frank won’t be back, though Atchison and/or Feliciano could be. We likely also won’t see Aardsma returning. Ouch. Do you want to see any of the above in a Mets uniform in 2014? Will the Mets go after any of them? Of course, there’s the possibility of out-of-the-box thinking, such as signing a former starter and converting him to the bullpen — such as a Jeff Francis, Scott Baker, Tommy Hanson, or Clayton Richard; the full list of available starters can be found on the ESPN free-agent tracker. Short of the idea of converting a starter, I’m not seeing the Mets signing a prominent free-agent reliever prior to spring training. Maybe someone like Mitchell Boggs, Jeremy Bonderman, or Luis Ayala is mildly interesting, but considering they’re arguably the best of what’s left on the market, the Mets likely will have to overpay. And are any of them worth a guaranteed big-league deal? It appears to me that they’re best off signing a few to minor-league contracts, and/or adding some minor-league free agents to the mix. What’s your thought? Am I missing anyone? Share your ideas in the comments. 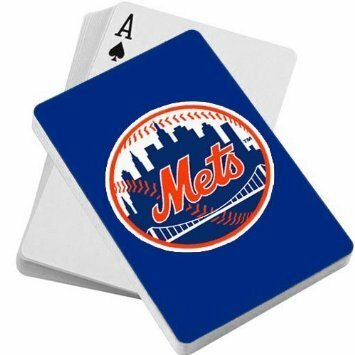 Since it’s possible the Mets bullpen will be an exercise of Terry Collins playing the cards he’s dealt, I think a set of New York Mets Playing Cards is appropriate. Back MetsToday Mailbag: Where Does Carlos Torres Fit? The lack of durability of bullpen pitchers is amazing to the point where if a reliever is good one year, I almost assume he is unsignable since he can’t be good two years in a row. I also can’t believe Dotel was on the list. Didnt the Mets include him in the Jim Fergosi trade in 1971? Also, if you are GM and you are punting on 2013 (sorry Dave), would you bother spending your little payroll on the bullpen? When people like myself get disgusted with the Met payroll, this is prime example how a low payroll hurts your chances for winning. An extra $5 million invested in the bullpen would help a lot. Fregosi? No, I think he was in the deal with Amos Otis that brought back Joe Foy. Joe, you forget that the Mets also traded Giancarlo Stanton for Fregosi. Or something like that. I’ll given Alderson credit for beefing up the ranks of candidates for the pen, and they young arms arm certainly better positioned to help in 2014. Still, the failure so far to bring in one veteran arm who has some previous closing experience tells me they are still penny pinching and not serious about fielding a playoff team for 201. Perez and Veras did not sign for big money, and let’s not forget they let 40+ Hawkins walk over pennies and then signed 40+ Colon. The stink still hasn’t left, but there is still time for Alderson to clear the air. As Joe points out, the list is running thin. Dare he bring back Franky Frank, he des fit the profile albeit he won’t exactly get the ticket phones ringing. oops, I meant punting on 2014. Gotta start making that change soon. Acting in this way encourages a subconscious influence in the resultant order. In this case, note the grouping of all players with first names beginning with “J” at the end of the list. Perhaps this is indicative of a repressed memory, in which the author was painfully placed last or excluded completely, considering that his first and last names also have this characteristic. I’m still haunted by being picked last for the kickball team in the fourth grade. Oh, that was so … freeing! I may finally have the courage to take a few steps up the staircase, and perhaps one day leave the comfort of my gramma’s basement. There are other players that will be brought in. These will mainly be older guys who have had injuries or have been down the last couple of years and will compete with minor league contracts. DeGrom is not going to be coming in relief. he will be a transition starter when players go down. He still may end up being traded. Since his status of avoiding super 2 is not as important as Montero or Thor, he can get a call if Mejia can’t go early or reinjures himself. I am doubting Parnell will be ready for opening day, i have a suspicion he may be this year’s Francisco and we never even see him. Mejia will either be the team’s fifth starter or will be hurt, i doubt we will see him in the pen. I am not sure Familia will survive long… he still has to show he can get outs. Edgin would make it, if healthy. He has been an injury waiting to happen though and cannot be counted on. I think the Mets will want to bring in at least someone else to compete. I would like to see Boggs myself. Brett Tomko is hitting 92 on the gun right now and can be had for a minor league deal also if you want a vet who has not pitched in a while to at least try out. In listing the Mets bullpen possibilities within the organization I think you forgot another former Blue Jay Joel Carreño who’s coming off a very successful year in the minors and having a terrific winter league showing as well. You also have John Church and Jeff Walters competing, too, and Jack Leathersich is an awesome arm with no control but on the periphery looking in. Thanks, Reese, I completely forgot about Carreno and agree he’ll be part of the mix. There must be a few other ST invites I’m missing; they’re not yet listed on Mets.com. I don’t think Walters, Leathersich, or Church will be competing for the Opening Day roster, but I could be wrong. My guess is if we see any of them in 2014, it will be after April / May. With a few exceptions, predicting the success of a relief pitcher from year-to-year is a real crap shoot. Given that the Mets are not going to be contenders in 2014, I’d rather spend the money elsewhere and go with the young arms. Your comment is a carbon copy of what I would have said. But I think the current group of arms has potential. The acquisition of Black was decent, and I might be alone in believing Edgin could be effective in 2014, but he did show promise before he got hurt. I’d have held onto Hawkins, though I’m not sure that was even a possibility. Germen is the most interesting name to me. I don’t see many relievers out there with nasty change-ups, plus the velocity to start hitters’ bats early. I like the upside! On the other hand, he needs to locate better, and age 26, entering his 7th year in pro ball, seems a bit late for that. I think Black and Torres can contribute. Lefties can’t hit Rice. If Parnell is healthy, add Germen and that’s an acceptable front 5. I expect to see Walters win a competition with scrap heap guys for the 6th spot. The 7th spot will go to some lefty who looks better in spring training than the other lefties. If the competition is Byrdak or Feliciano, I’d give the edge to Edgin, as those two guys are redundant with Rice (i.e. toast vs RH).